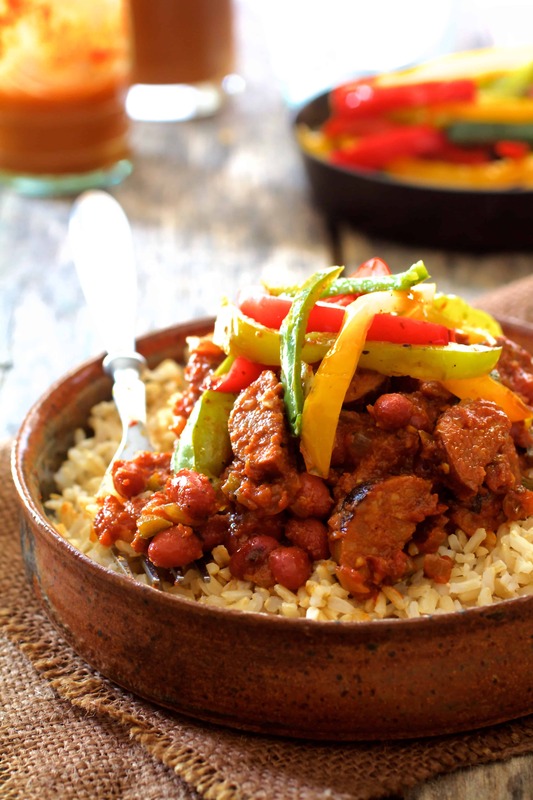 Red Beans and Rice with Chorizo and Bell Pepper Saute is perfect fall Tex-Mex inspired comfort food that’s still on the light side! One of the things I look forward to most in the fall is just being able to open our windows–and we can now open our windows! The sun is shining and a gentle fall breeze is wafting in. Do people really say “wafting?” Oh well, I just did and I’m thoroughly enjoying the wafting! 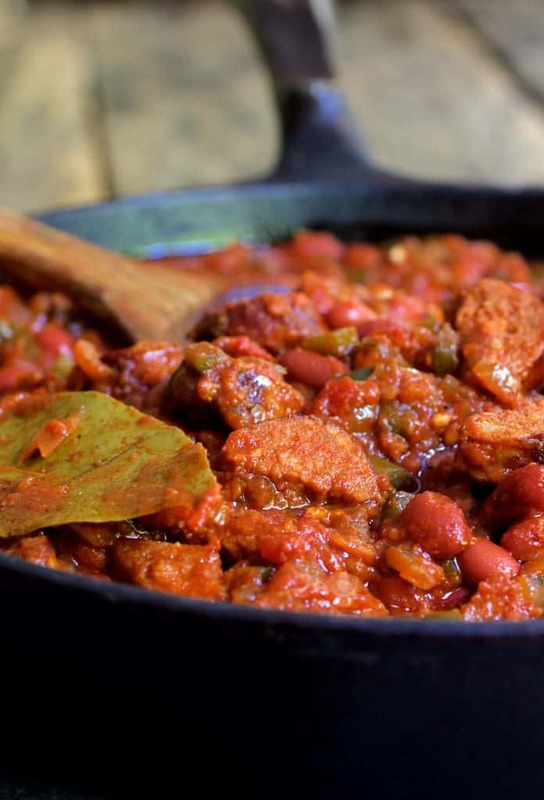 This Red Beans and Rice with Chorizo and Bell Pepper Saute is perfect for an early fall dinner to enjoy along with those gentle fall breezes. 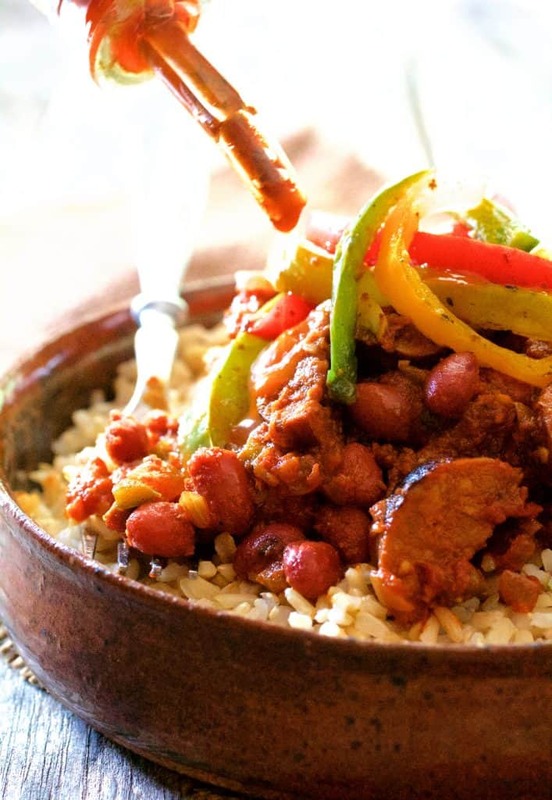 The combination of beans and rice to make a meal is shared by cultures around the world. When combined, these budget-friendly food staples form a complete protein. Fresh Mexican-style chorizo (which I prefer to use here) is different from Spanish chorizo. 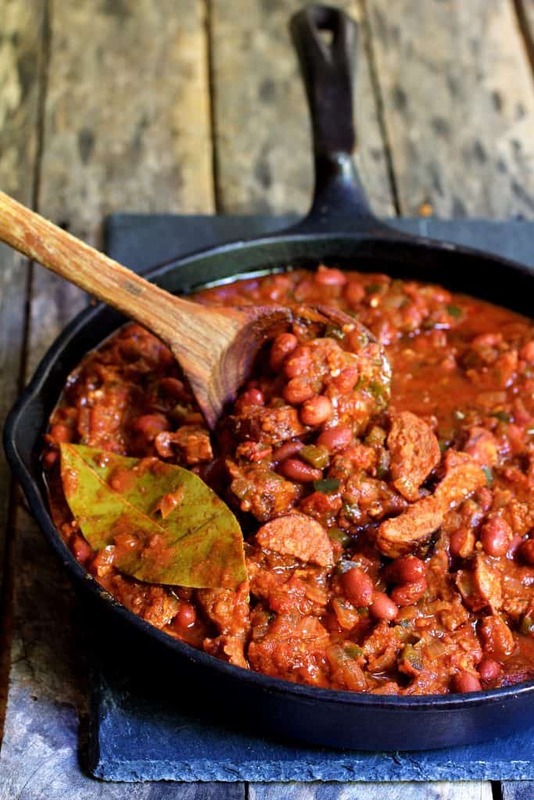 Both are made from pork, however, Mexican chorizo is raw while Spanish chorizo is cured and smoked. Here’s everything you ever wanted to know about chorizo. If you’re not into pork and can find chorizo made with chicken or even a soy chorizo, by all means, use it. When cooking with dried ground spices, I add them to the fat in the pan then cook very briefly before adding the other ingredients. I feel this helps to “open up” the flavor. 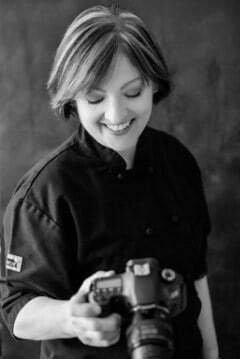 A rule of thumb I follow when deciding to use canned beans for convenience or start with dried beans, is how much the beans will dominate the dish and the other textures going on in the dish. For a dish like this, canned beans are fine. Just be sure to rinse them thoroughly because the liquid they’re packed in can be quite salty. You can cook the rice while making the red beans and rice. One of the easiest ways I’ve found to cook brown rice is to simply boil it like pasta. Get a pot of water boiling, add salt to taste, then the rice (no need to measure) and let it boil for approximately 25 minutes. If the water gets low, add more to keep the rice moving so it does not cook in its own starch. When it’s cooked to an al dente stage, drain it well in a sieve and you will have beautiful, fluffy brown rice. Brown rice is something I like to cook a lot of at one time; it freezes well so it’s always ready for a quick side dish. I top this dish with a tangle of brightly colored bell peppers. Use any color or combination of peppers. A splash of fresh lime juice makes the saute sing! Then, light the dish on fire with your favorite hot sauce if desired! Let’s eat! Red Beans and Rice with Chorizo and Bell Pepper Saute is perfect fall Tex-Mex inspired comfort food that's still on the light side! BEANS: Heat oil in a large saute pan over medium-high heat. Add the fresh chorizo links, reduce heat to medium and brown well on all sides. (Will not be completely cooked through at this point.) Transfer to a cutting board to cool. When the chorizo is cool enough to handle, slice lengthwise, then slice into 1/2-inch pieces. Meanwhile, add onion and Ancho pepper to the pan. Cook 4-5 minutes on medium-low or until beginning to soften. Add the garlic, chili powder, coriander, cumin, oregano and bay leaf and cook briefly, approximately 15 seconds. Add the tomatoes, chicken broth, chorizo and beans. Bring to a boil, reduce heat to low and simmer 12-15 minutes or until thickened and chorizo is thoroughly cooked through. Remove bay leaf. Season to taste with salt, black pepper and hot sauce. Serve with brown rice and sauteed peppers. PEPPERS: Heat canola oil in a saute pan over medium-high heat. Add the bell peppers and garlic and cook 3-4 minutes or to desired doneness. Add lime juice and salt and pepper to taste. Serve atop beans and rice. MAKE AHEAD: Can be made up to 2 days ahead. Add 1/4 cup water if very thick. Heat thoroughly on the stovetop. FREEZER-FRIENDLY: Cool thoroughly and freeze up to 3 months. Previous Post: « Soup’s On! Seven Soups to Kick Off Your Autumn! This sounds absolutely delicious! And your photos are gorgeous 🙂 Chorizo is the way to my heart, haha. Thanks, Isabel! I’m fast becoming obsessed with chorizo, too!